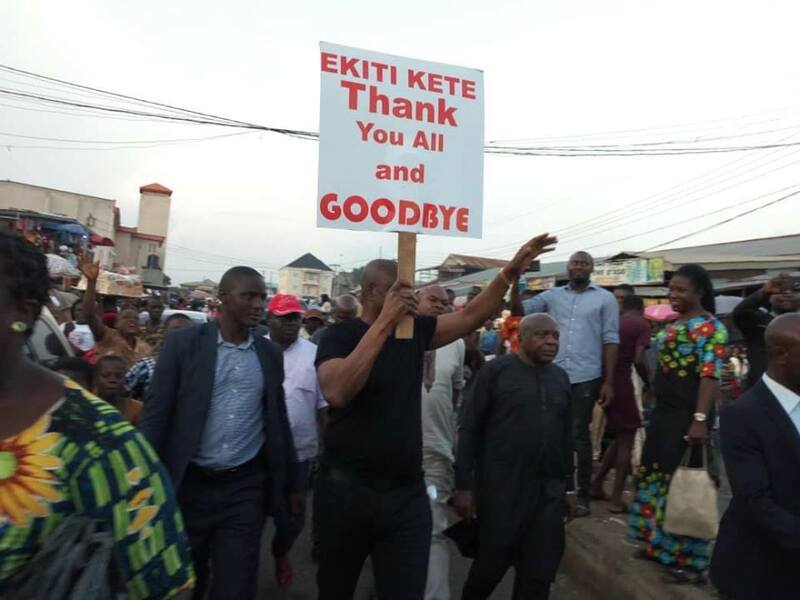 THE outgoing Ekiti State governor, Ayodele Fayose, yesterday vacated Oke Ayobo, the Ekiti State Government House. Fayose, who left Ado-Ekiti with his personal aides in a long convoy was sighted heading towards the Akure road. Many had lined up the streets to bid him farewell enroute the Akure Airport, Ondo State where he said, he would be catching a flight to Abuja. At a thanksgiving earlier in the day, which was held at the Government’s House chapel, Fayose thanked the people for their support in office, adding that he would always be with them, urging them to trust in God for a better future for him and the state. The event was attended by traditional rulers led by their Chairman and Oloye of Oye-Ekiti, Oba Oluwole Ademolaju and the Ewi of Ado-Ekiti, Oba Rufus Adejugbe. Also at the event were the wife of the governor, Feyisetan, the outgoing Deputy-governor, Prof. Kolapo Olusola and his wife, Janet; the Chief of Staff, Dipo Anisulowo; Head of Service, Dr. Gbenga Faseluka; the Secretary to the State Government, Mrs Modupe Alade; former Speaker, Kola Oluwawole; members of the National and State Assembly, and members of the cabinet among others. In his remarks, Fayose said he was leaving a contented and fulfilled man. He said: “I’m contented, I’m happy and I say thank you. Don’t worry about me, I will come back. I will rise to the glory of God. I have enjoyed uncommon grace; I will never complain but thank God.” Reacting to the claims that he was on the run, Fayose said he was neither afraid of EFCC nor ready to escape to anywhere. Fayose, who spoke with newsmen at the Akure airport, said he was on his way to Abuja to honour the EFCC’s invitation. His words: “My tenure expires on the 16th of October; this is the journey to Abuja. It is safer to be in Abuja than to be in Lagos and be creating impression that you want to escape. “There is no seaport in Abuja, EFCC doesn’t need any drama, I am a man of courage, I have told them I’m coming and I’m on my way to them. “So, after a meritorious service, anybody who wants to call me to question, I’m available to them, just one call away. And my going now is my demonstration to them that I’m a man of my words.” “I’m not scared of anything. I always say to people that the life of a man does not consist in the abundance of what he has, life is for the courageous, not for the weak.